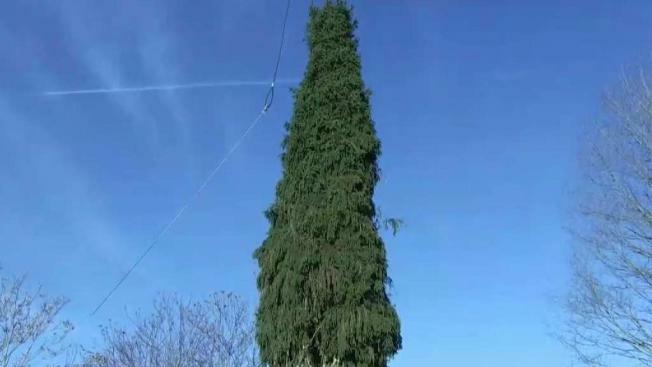 The 72-foot tall, 12-ton Norway Spruce that will be the 2018 Rockefeller Center Christmas Tree was cut down from its home in upstate New York Thursday and will head to the city for its new home in the Plaza. The tree, which is 45-feet in diameter, comes from the Wallkill home of Shirley Figueroa and Lissette Gutierrez, who gave the spruce a last hug before it was chopped down. Crews then hoisted the tree on a flatbed to make its roughly 75-mile journey to midtown Manhattan, where it is expected to arrive on Saturday. About 50,000 LED lights and a new Swarovski crystal star designed by Daniel Libeskind will adorn the tree, which will be lit on Nov. 28. It will remain on display until Jan. 7.